The gospel reading for Proper 22B/Ordinary 27B/Pentecost 19 (Mark 10:2-16) includes exchanges on the topics of marriage/divorce and children. The child-illustrated episode here is not exactly that of Proper 20B/O25B/P17, but the blog post written for that Sunday discussed various arrangements of Jesus and children, so it seemed a bit redundant to approach the text from that point of view. Having the exchanges about marriage and divorce and children in proximity to one another brings to mind questions about what it might have been like to grow up in the house of Mary and Joseph, a subject on which scripture is remarkably silent. Except for the episode at the temple when Jesus was twelve years old, canonical scripture gives no mention of Jesus' childhood, adolescence or young adulthood. But it is in the house of Mary and Joseph that Jesus would have most fully seen a marriage and the worth and role of children, both topics addressed in this week's readings. Because the text is silent, artists have had free reign to imagine life in that household. Considered through the paintings, life might have been tedious, with every act of the young, growing Jesus taking on a foreshadowing of his life on earth. 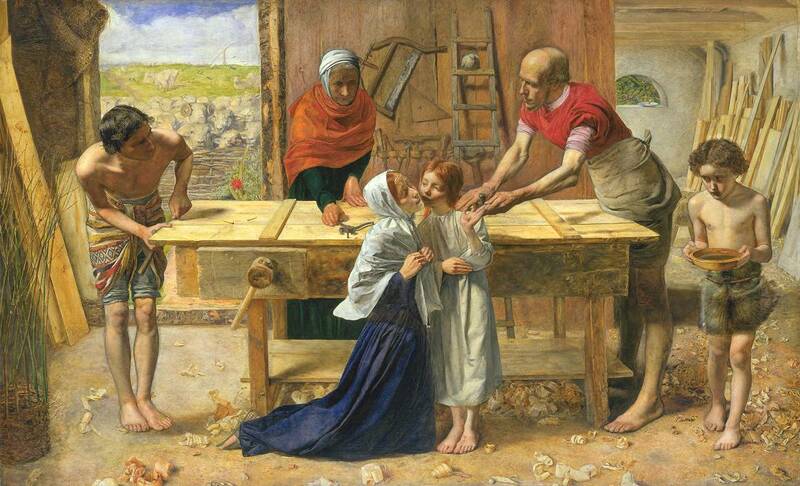 Consider John Everett Millais' Christ in the House of His Parents, also called The Carpenter's Shop. Here the boy Jesus has drawn blood via a wound caused by a nail in Joseph's carpenter shop. The blood pools in his palm and drips on his foot as his mother comforts him. 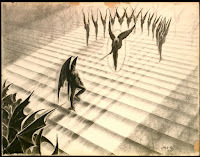 His cousin John (the baptizer) brings a bowl of water to wash away the blood while a white dove sits on the rung of a ladder leaning against the back wall. These clearly foreshadow Jesus' baptism and crucifixion. Millais based the scene on a local carpenter's shop, going so far as to get sheep's heads from a local butcher to use as the basis for the flock seen through the open door. Millais. Christ in the House of His Parents. 1849-50. Oil on canvas. London: Tate Britain. The painting was not universally acclaimed. Charles Dickens wrote that the boy Christ was "a hideous, wry-necked, blubbering, red-headed boy, in a bed gown" (Household Words, 15 June 1850). In this interpretation, Mary and Jesus form a unit with Joseph and assorted other people orbiting around them. 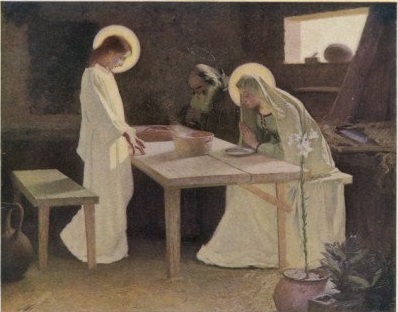 American artist Frank V. Dumond shows an older Jesus with an older Mary and Joseph. The three gather around the supper table. Jesus and Mary glow in their white garments while Joseph sits in shadows wearing dark clothing. Joseph is given only a thin ring halo, while the other two members of the family have solid disks announcing their holiness. As in Millais' picture, there is a wooden table in the room, no doubt made by the carpenter-in-residence (though the brace along the parental side of the table makes one wonder about the structural soundness of the furniture and the abilities of the carpenter). Jesus stands on one side of the table while his parents prepare to receive the meal. In this composition, Mary and Joseph are more of a unit, seated side by side, though Joseph tends to disappear and Mary's affinity with Jesus is shown in their white garments. Frank V. Dumond. Jesus with His Parents at the Supper Table. The lilies, common in scenes of the Annunciation as symbols of Mary's purity, are still here growing in a foreground pot. A single window pierces the wall of the house and allows light to shine on Jesus' clothing. Parents and child gather together to share a meal in a prefiguration of Communion with Christ presiding at the table rather than his father. Marriage and divorce...the worth and role of children...the dynamics of family life...Jesus spoke about all of them. He experienced them firsthand in the house of Mary and Joseph. 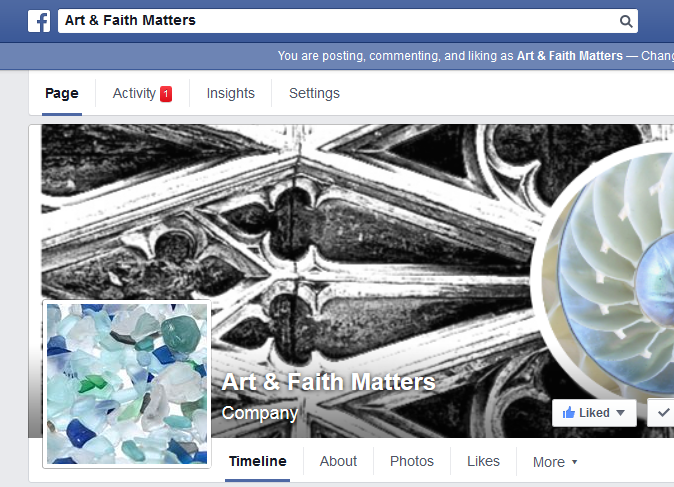 For thoughts on Job 1:1, 2:1-10, click here.